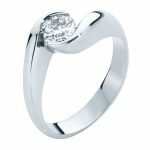 Solitaire engagement ring with a 0.55ct Brilliant cut diamond set in an 18ct White Gold band. Also available in Yellow Gold, Rose Gold or Platinum, and with your choice of diamond or coloured gemstone. Matching wedding ring can be custom made to order.